To facilitate the changing dynamics of education in modern era, The Child Education Centre for Teaching & Learning takes a bold step ahead and integrated interactive technologies to develop new ways of teaching. Situated at Shatin IVE, a bezel-less display system of whooping 165 inches finally made its grand debut and is ready to be played with motion sensing games. Teachers will take advantage of the system and develop content that is otherwise restrained and limited. Multiple mini games including job simulation, reality quizzes and money management serve to shape the children’s mindset toward morality, commonsense and social behavior as part of their all-rounded growth. Children and teachers from SKH Holy Spirit Church Wo Che Kindergarten participated in the opening. 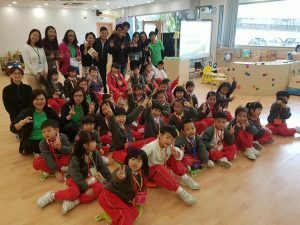 They were thoroughly inspired by the interactive learning and the teachers felt the need to incorporate simulated experiences to strengthen the children’s awareness and development.